Anita Hemmings is bright young woman with lofty academic aspirations and goals of someday becoming a professor. Her grades certainly show promise and she is well liked among the faculty and students at the prominent campus of Vassar College – the only university she ever wanted to attend. Anita’s dreams of bettering herself through a college education at Vassar are coming true, and while she seems to be just like every other female student at the college – Anita has a secret that could ruin her. She’s a descendant of African American slaves – and if her race were known by the administration of Vassar college she would be removed immediately. With her senior year upon her, and rooming with the illustrious and infamous Lottie Taylor, the daughter of one of New York’s most prominent families, will Anita be able to maintain her white façade and graduate from Vassar with her true origins undetected? 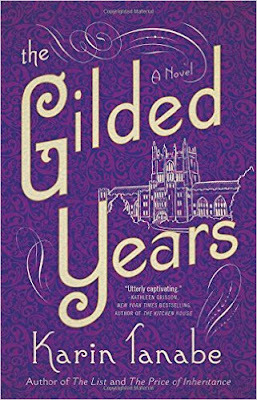 Set in the late 1890’s, The Gilded Years is based on the true life of Anita Hemmings, the first black woman to graduate from Vassar College at a time when African American women were not admitted. Unlike some of the other Seven Sisters schools at the time such as Radcliffe and Wellesley, African American women were not allowed entrance to the school – and while some of these universities did admit black students, they were very few in number. I found this novel absolutely engrossing. Anita’s story is fascinating and heartbreaking at the same time. Passing as a white woman in one of America’s elite female colleges during a time when racial tensions ran high and racial equality was not a social normality, Anita Hemmings chose to live a double life to pursue her dreams of a Vassar education at the risk of losing everything. Beautifully written, Tanabe dazzles the reader with descriptions of an antiquated and elite way of life with a protagonist who is relatable and charming. I found this novel to be easy to read and very interesting, which allowed me to finish it in only a couple of days. While well written and very interesting - it's a little slow to start but quickly builds as the reader becomes more familiar with the characters, customs and plot of the story. I believe that fans of women’s historical fiction will enjoy this one, I know I did!